I was having the usual sharing difficulty getting my OS/X Macs to use a Windows shared Printer. I had it working rather pathetically on an older computer running Windows XP but it required logging in everytime you printed. 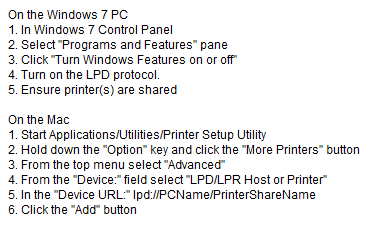 Windows 7, despite the setting designed to allow sharing printers with users who did not have accounts or passwords, fared no better. Actually even worse, with matching accounts, or even entering accounts, using the printer simply didn’t work. Now, I am sure this is all just total garbage from when Apple and Microsoft didn’t get along, or worse yet, just plain stupid as both companies seem to think the world uses printers with passwords. This would be why I use Google Chrome to share my printers and am looking forward to upgrading my router to handle a network printer. 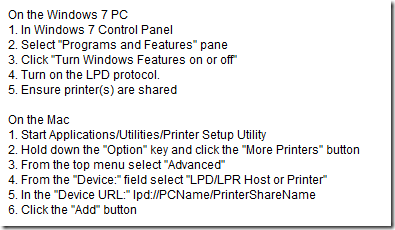 And while I suffered thinking about the network printer I recalled LPD lurking in Windows 7. Turn it on and in no time at all sharing the printer works just fine. I always smile when it is UNIX that makes both an Apple and Windows computer perform the appropriate tasks. After all these years, neither really is robust in itself, and scanning a network is beyond either. Try this sequence to solve the issue. My thanks to Microsoft Answers for the instruction set.